Below our information you’ll find real guest reviews and your chance to submit your opinion. 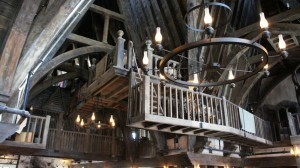 What is The Three Broomsticks? The Three Broomsticks is the only restaurant inside The Wizarding World of Harry Potter – Hogsmeade, located at Islands of Adventure. 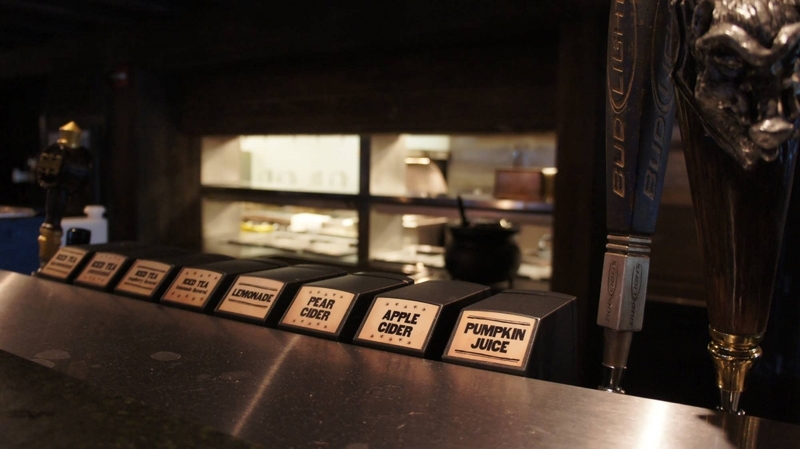 It is quick-service; open for breakfast, lunch, and dinner; and serves traditional British fare. 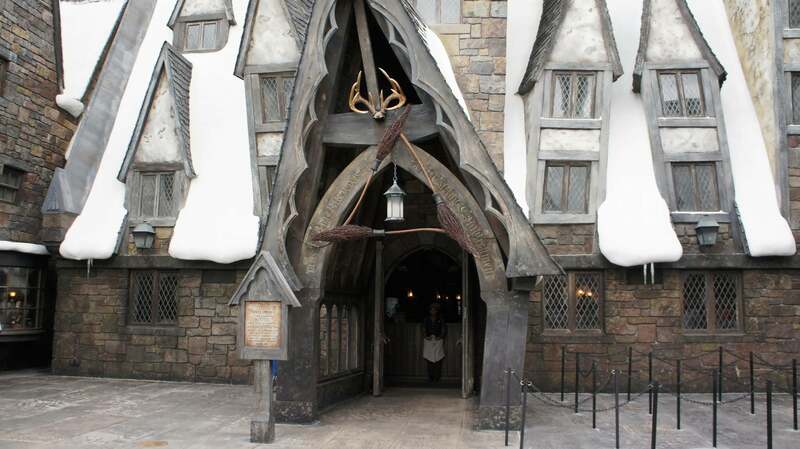 You can find it off on the left-hand side of the street upon first entering Hogsmeade Village (using the main entrance, from The Lost Continent, that is), across from the Owlery. 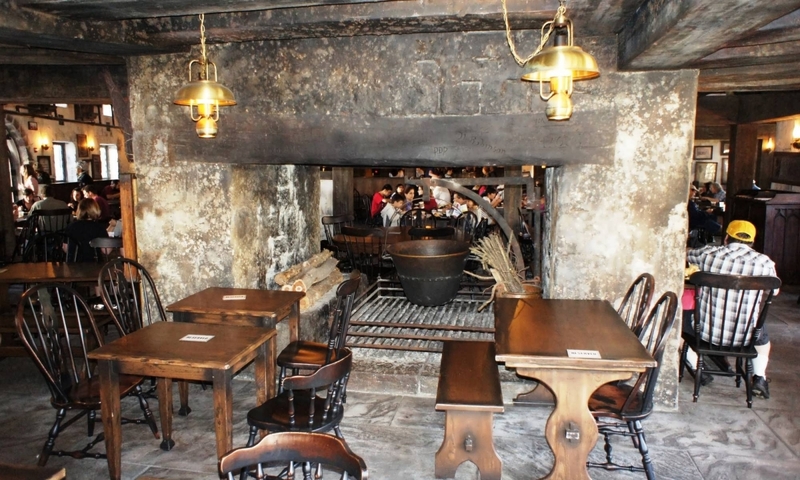 Connected to Three Broomsticks is the Hog’s Head, a small pub that specializes exclusively in drinks, including Butterbeer (even the frozen variety), Pumpkin Fizz, a selection of draft beers (some of which are brewed exclusively for the Wizarding World), and a few spirits. 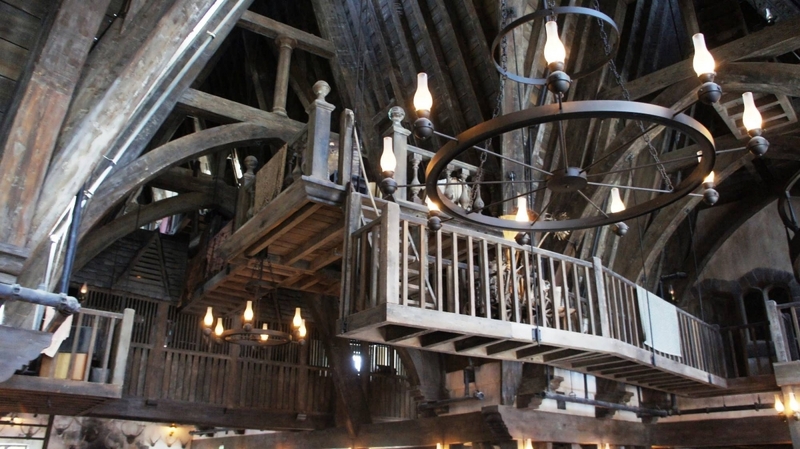 Both sections of the venue feature theming that is nothing short of immaculate, from the faux upstairs to the moving hog’s head behind the bar, making it second only to Hogwarts Castle in all of Hogsmeade. 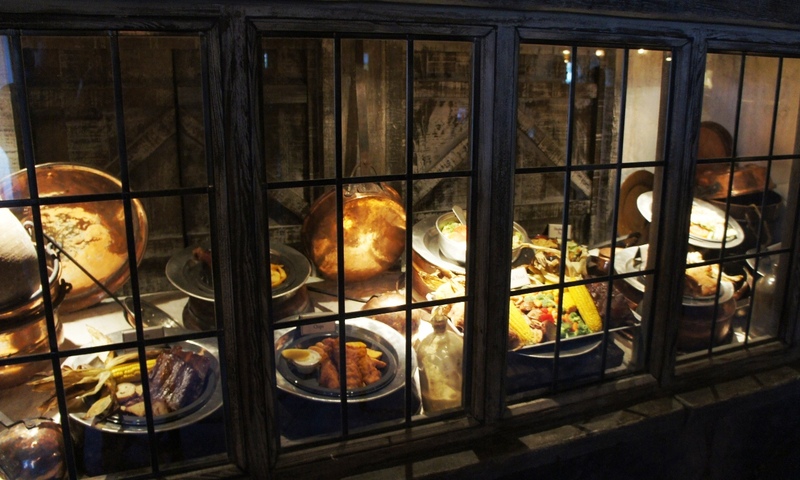 While the food here is fairly standard in terms of taste – it features many of the same dishes, for instance, that Thunder Falls Terrace carries over in next-door Jurassic Park, such as rotisserie chicken and corn on the cob – what makes Three Broomsticks/Hog’s Head a must-do experience is the immersive atmosphere; there’s nothing quite like enjoying a meal inside what is one of the most detailed, authentic, better-than-movie-quality sets in all of Orlando. 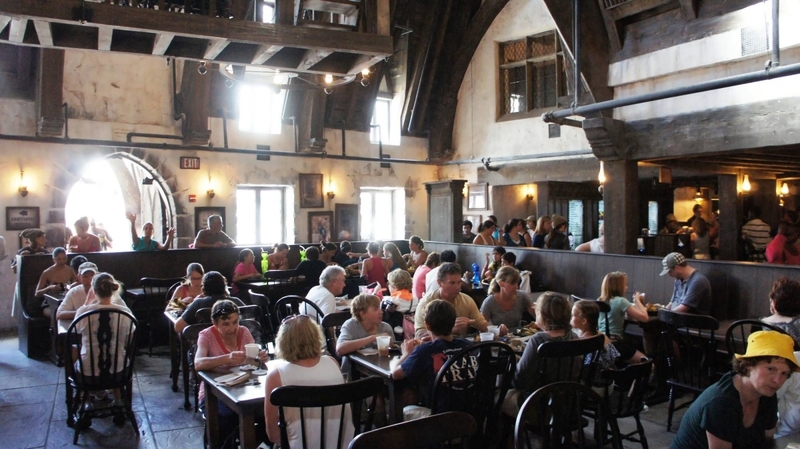 Other than Harry Potter and the Forbidden Journey, this restaurant is as close as you can get to being in Harry’s wondrous world (until you make your way over to The Wizarding World of Harry Potter – Diagon Alley, of course). 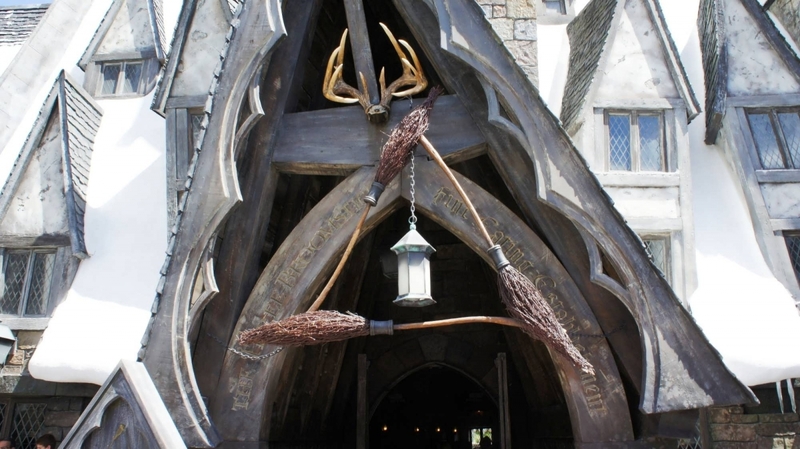 What are The Three Broomsticks’s hours? 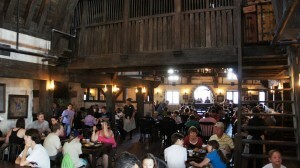 The Three Broomsticks opens and closes with Islands of Adventure itself. 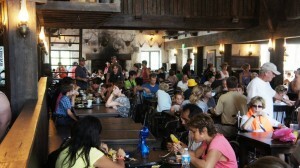 However, there are two caveats to this: firstly, the restaurant may not immediately open its doors when Early Park Admission is at The Wizarding World of Harry Potter – Diagon Alley (for more on EPA, including a full description of what it is and how it works, please see our complete guide). And, secondly, it may stop serving shortly before closing time, just to ensure that all patrons can be cycled out in time for the theme park to shut down. Note that breakfast is served until 11:00 am. To answer a very common question up front: no, there are no reservations for lunch and dinner – it’s first come, first serve. 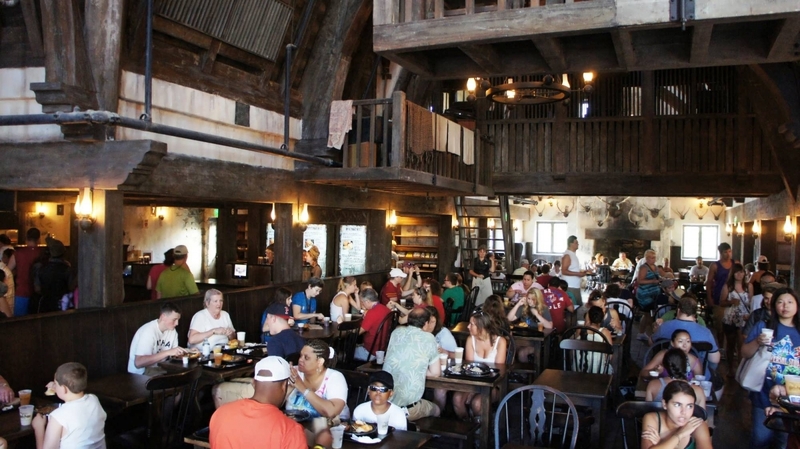 Breakfasts, however, are something of an exception: Universal sells vacation packages, a feature of which is a breakfast at both Hogsmeade’s Three Broomsticks and Diagon Alley’s Leaky Cauldron. 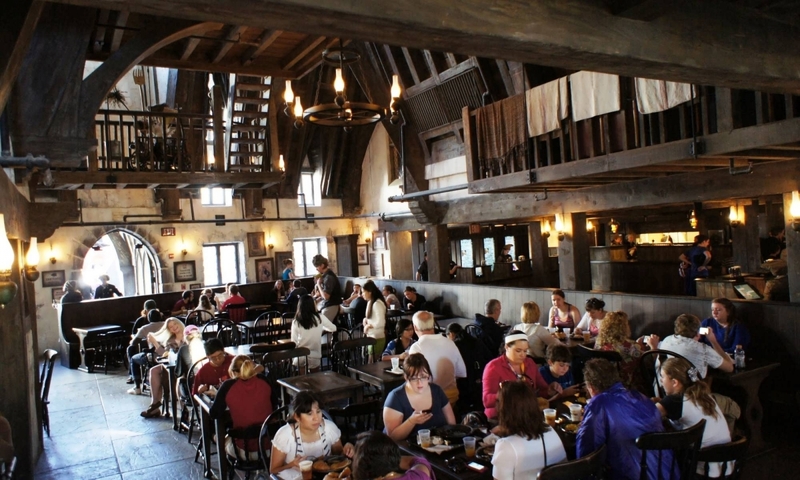 For the first two years that the Wizarding World was open, when the area was constantly jam-packed with throngs of muggles, these reservations were absolutely critical to securing your spot for a morning meal; now, however, anyone can generally walk in and nab a seat. 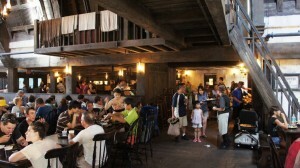 Still, there is the slight possibility that, as a walk-in guest, the restaurant could be all booked up and, as such, have a very long line on busy days – so if you want to ensure that you can scarf down your pancakes and black pudding before hopping on Flight of the Hippogriff without wasting your entire morning, you’ll need to go the vacation-package route. 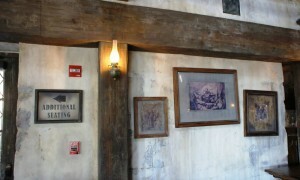 When you first enter, a team member will typically be stationed at or by the front door, handing out menus for you and your party to peruse while waiting in the short queue that is situated inside the building; here, you’ll find mock-ups of the various meals, giving you a better chance to examine and weigh your options. 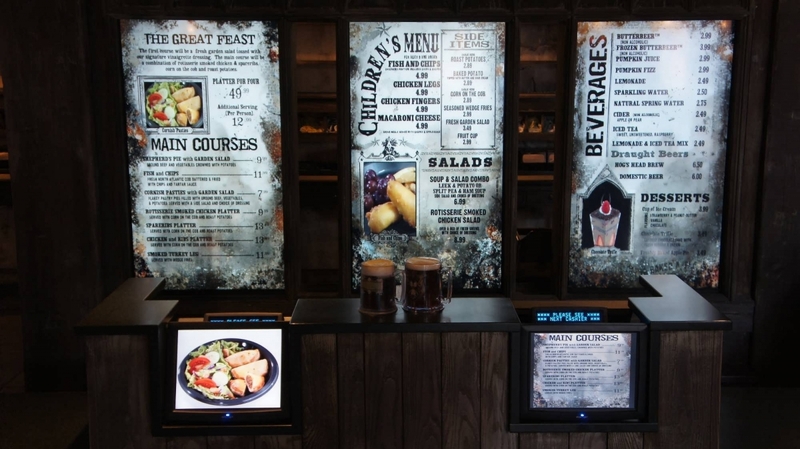 When you reach the end of the line, another employee will direct you to a counter to place your order (note the full-size, moving-image versions of the menus here), after which you’ll be directed to go to yet another counter to pick up your food. When you’re finally armed with your tray of goodies, you’re free to pick your own seat (don’t worry – you can find napkins, condiments, and utensils neatly tucked away at most every table). 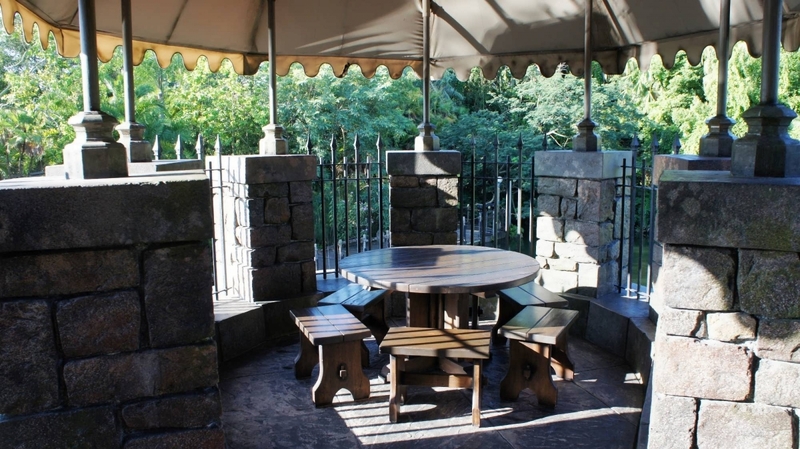 Each section has its own particular charm and collection of Easter eggs, but might we suggest an area that you might not normally think of first: the large back patio behind The Three Broomsticks? 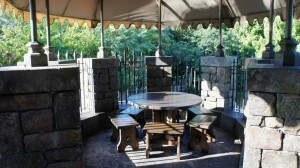 There are almost always empty tables back here, and it provides a great view of Hogwarts Castle and the rest of Islands of Adventure – in fact, we recommend that guests make their way back here to sit a spell even if they’re not chowing down on any Broomsticks grub (especially if they need to find a good spot to watch the Nighttime Lights at Hogwarts Castle projection-mapping show from). As previously stated, the decor and decorations of The Three Broomsticks are nothing short of striking. 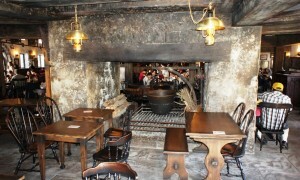 In the Harry Potter source material, the pub doubles as an inn – don’t forget that Hogsmeade Village is the only entirely non-muggle settlement in all of Britain – and Universal has made good on this fact by hinting at a fictitious upstairs where all the wayfaring witches and wizards reside, replete with (inaccessible) staircases and walkways. If you keep casting your eye upward, you can’t help but notice the beautifully-impressive rafters and chandeliers, which are augmented with – if you keep your eyes peeled – the shadows of House-elves being cast on the upper walls as they go about their daily housekeeping chores. 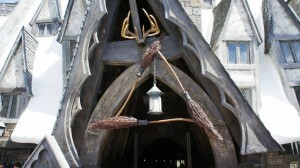 What truly makes Islands of Adventure’s rendition of Three Broomsticks so amazingly faithful to its big-screen counterpart is the fact that it served as the model for the films instead of the other way around. 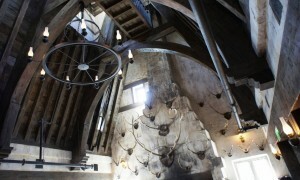 That’s right – Stuart Craig, the art director for the movies, had only built the smallest of sets for the pub prior to The Wizarding World of Harry Potter – Hogsmeade’s opening in 2010, and when it came time to properly feature the location for the sixth installment (in 2009’s Harry Potter and the Half-Blood Prince), he ended up using the theme-park blueprints as the basis for the newly-expanded sets. 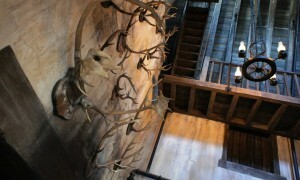 So that means, yes, that exact table you were sitting at next to the giant fireplace with all the mounted antlers is precisely the same one that you’re now looking at on screen. All of which just underscores The Three Broomstick’s value in being the only Harry Potter venue where you can enter, sit down, and take your time looking at all the visual details in (relative) peace – even all of Hogsmeade’s shops, such as Honeydukes and Dervish and Banges, tend to be too busy (or too small). 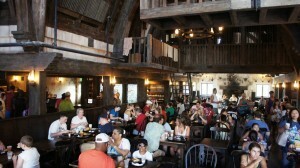 Entrees at The Three Broomsticks run from $10 to $17 per person. The Great Feast serves four at $59.99. 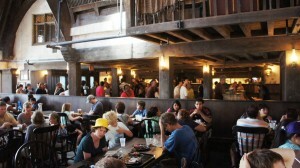 The Three Broomsticks and Hog’s Head Pub have a large seating area outside, behind the building. If you are just looking for a place to sit, whether you’re eating a meal or not, there’s almost always empty tables back there. Also, you get a great view of Hogwarts Castle and the rest of Islands of Adventure. 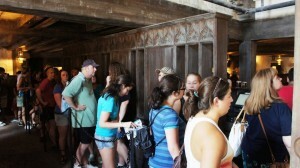 Is Three Broomsticks too busy? Head down to Thunder Falls Terrace in Jurassic Park – they sell many of the same menu items (rotisserie chicken, corn on the cob) as the wizarding establishment. 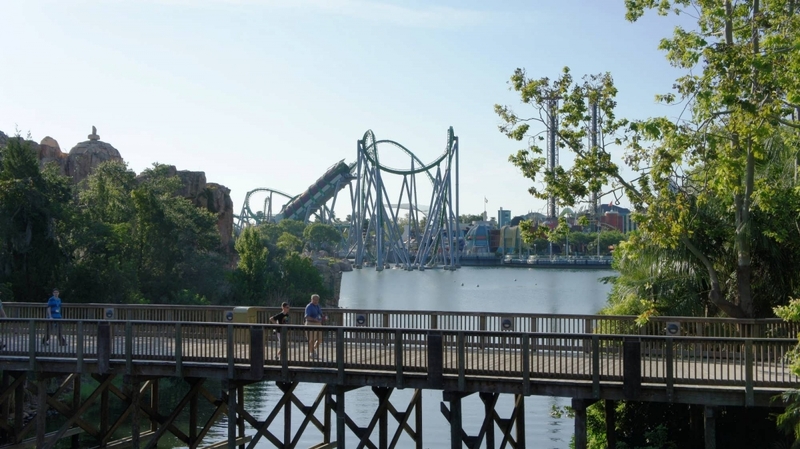 Spent this past weekend in Orlando at Universal and IOA and had a wonderful time (only thing better would've been a DA soft but what can you do). Absolutely love the decor and atmosphere of the Three Broomsticks, it (along with most everything else ) looks like it stepped right off the pages of the Harry Potter books. Be sure to check out the bar where the Hogs Head actually moves. And if you fall in love with butterbeer (like my family did, we even trekked over from the Universal side to get another one and the walked all the way back!) be sure to get it here, it's actually a little cheaper! 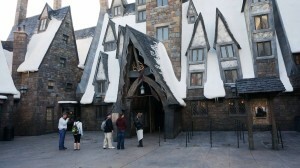 Outside at the carts a frozen BB is $5.50, but inside the Three Broomsticks it's $4.99, after tax that comes to $5.31. While not much cheaper, if you start to down those babies like family it certainly adds up! Also if you purchase the day meal plan at the park (where you get an entree, drink and snack) you can sometimes get someone to charge it as a drink (instead of a snack which it is considered) allowing you In essence to get 2 snacks! 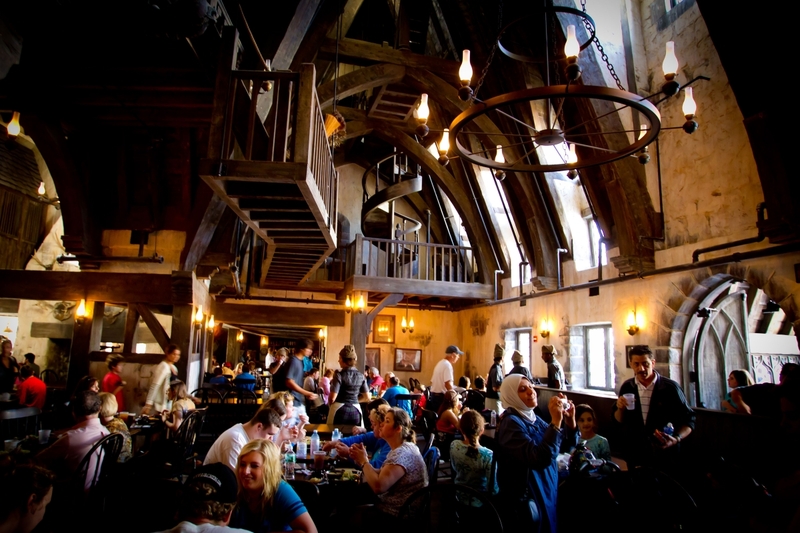 While visiting the most magical place in Universal Studios Island of Adventure, be sure to stop by the most magical eatery the Three Broomsticks & Hogs Head! 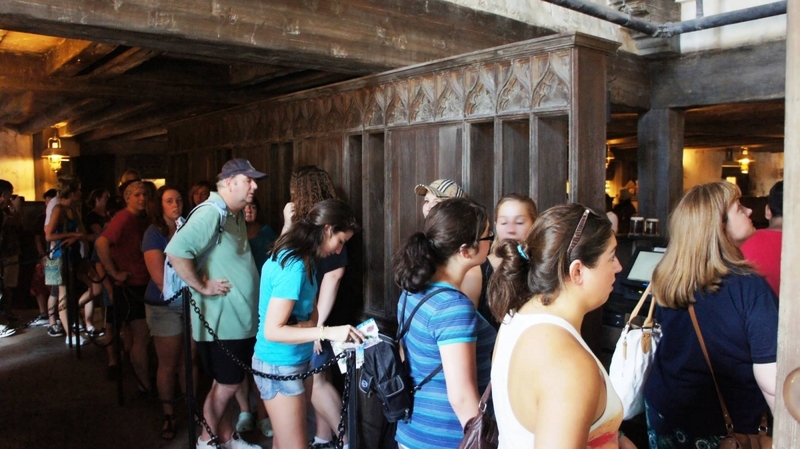 If you struggle with being a muggle as I do, spend a day immersed in the life of a wizard. 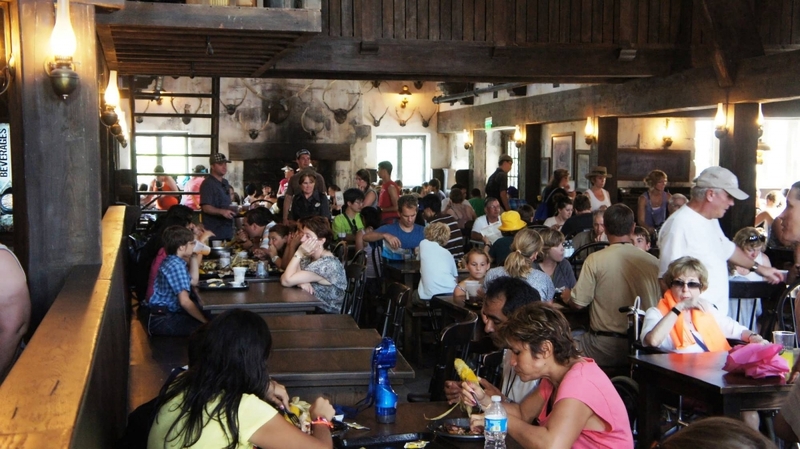 Adults and children alike will enjoy what Three Broomsticks has to offer. 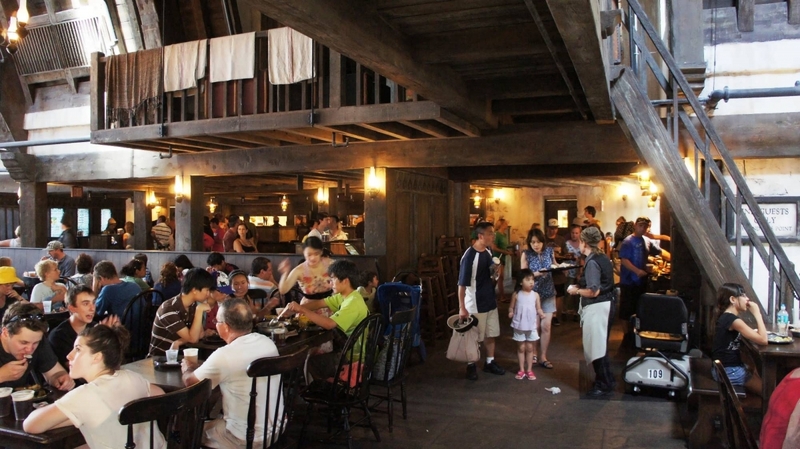 From a rustic turkey leg to a refreshing frozen butterbeer, the Three Broomsticks has all you need to keep you full while you gather your wizarding supplies and enjoy adventures along the way!Personally, I found the prices reasonable and comparable to any amusement park! 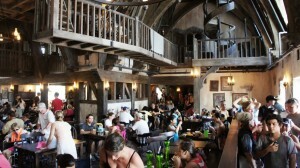 My recommendation would be to grab a butterbeer for a little break and sit inside the restaurant to simply soak up the genuine atmosphere! I cannot wait to return this June for another adventure! Three Broomsticks and Hog's Head is awesome! I visited there for breakfast and was impressed with the cavernous ceilings and attention to detail they gave the walls, furniture, and workers. They thought of the sounds too which I really appreciated. The biggest issue I had was that there was a park attendant at the door directing me to the line area but then you were on your own. I felt a little confused and unsure the ordering process as I happened to be there when no one else was. It felt like a cafeteria but set in the amazing world of hogsmeade. The food was great and the atmosphere is authentic. Overall, this place is great and I would definitely return. Maybe I was still half asleep? 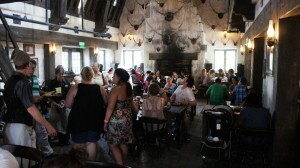 I can't add much to what has already been said about the Three Broomsticks or Hogs Head Pub. 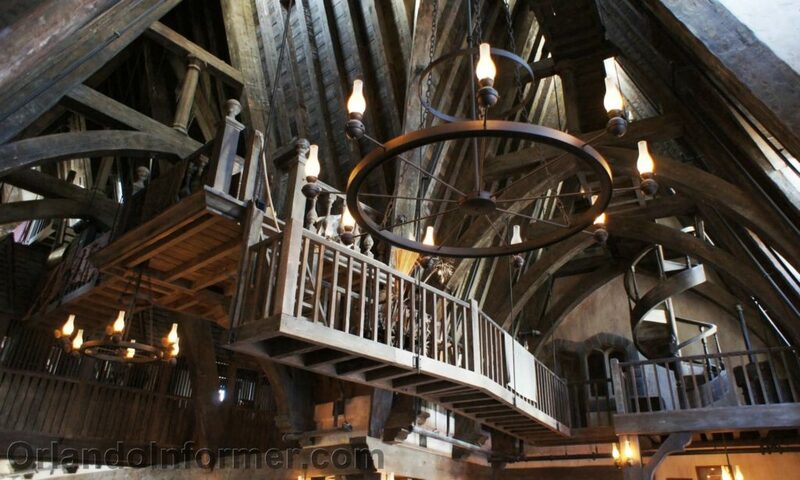 It's a great, detailed space which any Harry Potter fan would love. 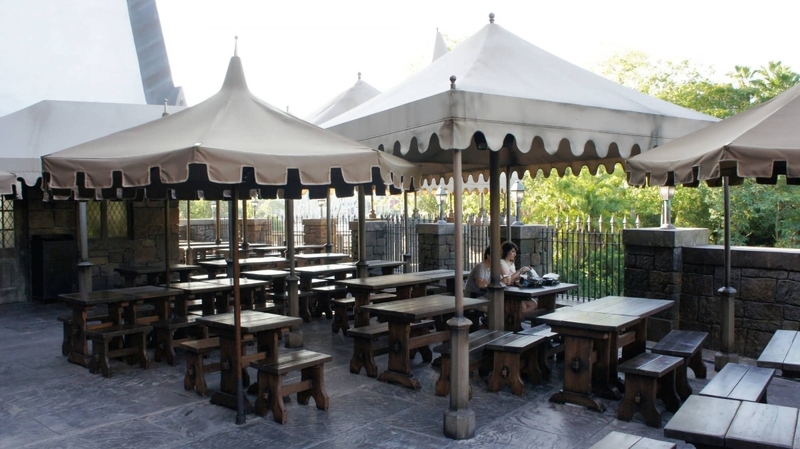 I do want to share that there is a back patio area, which is mostly shaded, where you can sit down and catch a quick respite from the crowds. Why is it never crowded on the back patio? I don't know. Maybe most visitors don't know that the patio is even there? Anyway, it is hardly ever crowded back there, and you can sit and take a break and drink your butterbeer in relative peace and quiet while enjoying panoramic views of Hogwarts and Hulk. 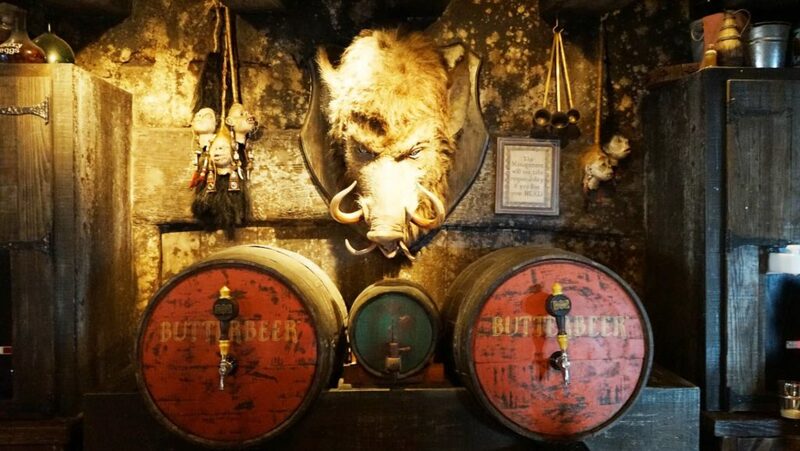 Get your butterbeer from the Hogs Head pub or the Three Broomsticks rather than at the busy carts in the heavily trafficked areas of the Wizarding World. 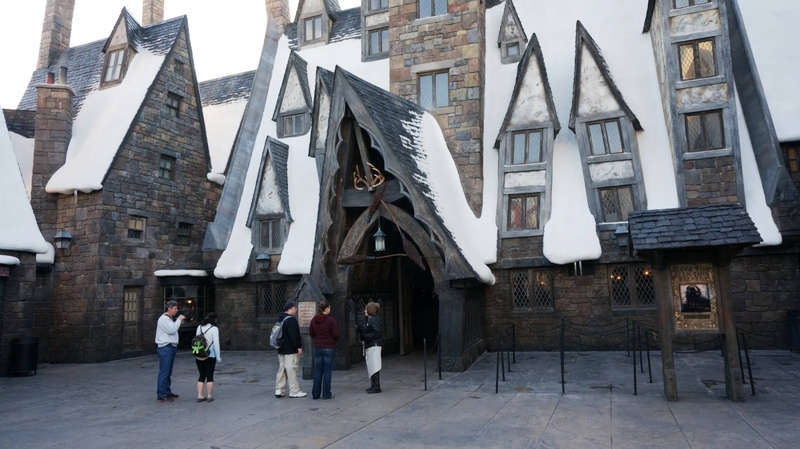 Before our first trip to Universal, I contacted the resort chef to learn where it would be safe for me, a person with severe gluten allergy, to eat. 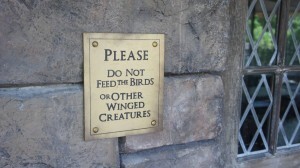 A single crumb of bread could leave me sounding worse than moaning myrtle in a bathroom for days! One of the Chef's recommendations was Three Broomsticks and I was thrilled it was on the safe list. 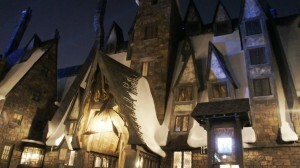 As a HP enthusiast I wanted the whole experience and the setting was truly magical. I had read on orlandoinformer.com that the movie set was based of the restaurant which made it feel so authentic.My favorite spot to dine was on the patio with a scenic view of Hogwarts. The food was good. So. very. good. I was impressed with the staff handling my allergy-free food. They were very conscientious, made sure to wear fresh gloves and not even put gluten items on the same tray as my food. I could not believe I could have a whole plate of food (such as chicken, corn on the cob, and roasted potatoes) all in one easily ordered meal. After the first day of safe eating, I made sure to eat there every single day! Therefore, I might not be able to review many restaurants but I can definitely vouch for how brilliant this one is! Do you have a question about the information on this page, would like to provide feedback, or did you spot an inaccuracy? Please let us know by posting in our OI Community Facebook group.